IT organizations face the challenge of quickly delivery new services for business growth, while ensuring service level agreements are consistently met. The time and effort needed for manual deployment, configuration, monitoring and maintenance all drain the time and energy of IT staff that could be better employed driving innovation. Now imagine that you could build an infrastructure that has the flexibility to quickly provision resources based on the unique requirements of each application. Ideally this would leverage your existing IT investment, reduce the time and effort required by the IT staff, and keep your future options open by avoiding vendor lock-in. 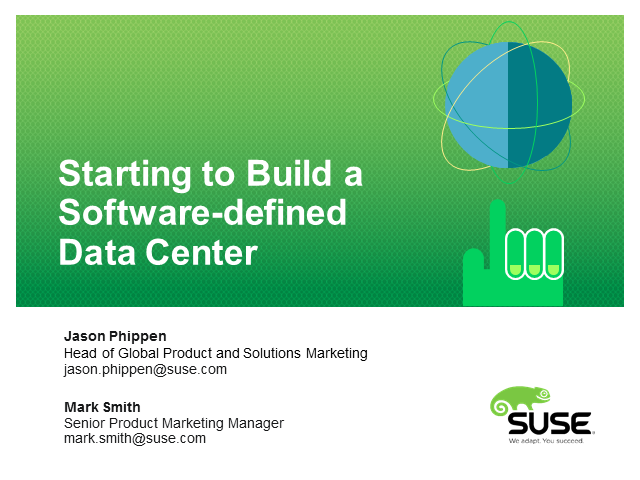 In this session we will describe how SUSE can help you start your journey toward the software-defined data center with open source technologies like OpenStack, Docker containers and Ceph, all hardened for enterprise operations and backed by outstanding support.